Check out these tips for keeping your chickens warm in the coming cold months. Raise cold –hardy breeds that are suited to the temperature in your climate. Breeds with smaller, more compact combs, such as a pea or rose combs, fare better in cold and are less prone to frostbite on their combs. Great examples of cold-hardy breed with pea or rose combs include Ameraucanas, Buckeyes and Wyandottes. Proper coop insulation and ventilation in any poultry housing set-up is absolute for fighting frostbite and for combating deadly moisture that could contribute to a host of other ailments and diseases. Many breeds can make it through winter without supplemental heat. 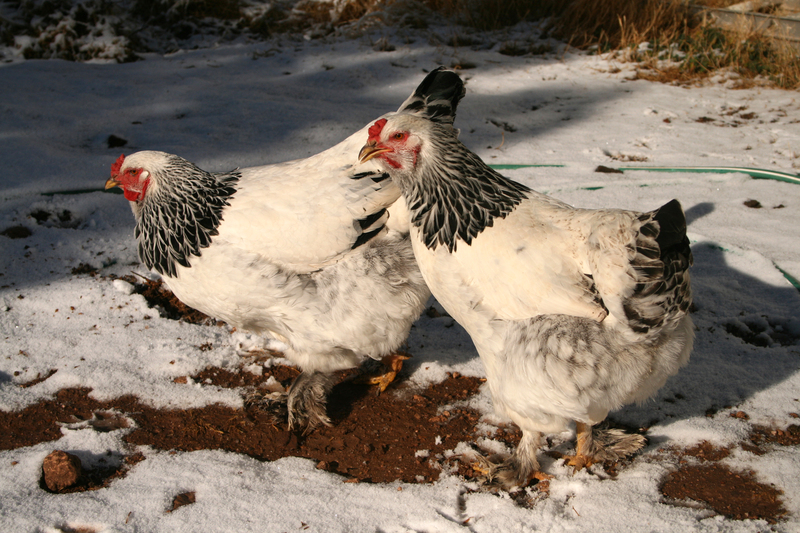 But for breeds that don’t always fare well in extreme cold, it may be necessary to add supplemental heat to the coop to combat moisture, cold or a combination of the two. Properly and professionally set up the supplemental heat in the coop. Use poultry-safe heat lamps with guards. Only heat the coop to a reasonable, winter temperature for your area to take the edge off; it should not feel warm to you. Reduce supplemental heating as soon as possible when temperatures begin to climb, and gradually acclimate the birds to the change of weather. Use flat roosts, as this allows birds to spread out their toes flat on the board, making them easier to cover with their feathers when they sit down for the night. Provide a snow-free zone so your birds are not uncomfortable and unsafe. A snow- free zone doesn’t have to be fancy or complex. It could simply be a run or pen with a roof, a tarped or covered area in the pasture or backyard, or simply a shoveled path around the coop. Consider your coop flooring. Chickens spend much of their day in direct contact with the ground; that environment should be free from moisture and extreme cold as much possible, especially at night. Consider employing the deep-litter method or use a bedding option that remains warm and dry in the coop. Pine shavings are a favorite because they dry faster and resist moisture better than hay or straw. Finally, consider providing perches, stumps and other places off the ground for birds to seek relief from the frozen ground while spending time outside. Utilize the information at your disposal to set up proper housing and prepare accordingly; it could save a lot of pain and suffering for your birds in the cold winter months to come. Previous PostSome interesting facts from the Iowa Poultry AssociationNext Post5 tips for getting hens to lay in nest boxes. For all of your poultry needs! When can I expect my chicks to arrive, and what do I do if there is a problem? A better understanding of the NPIP.